An important aspect to consider is stress with respect to time. The following sketch summarizes some of these concerns. This creates a landscape on which we can place labels that describe various experiences. The vertical, quality, axis captures the quality of stress; if reality > expectation then it’s positive or eustress. If reality < expectation then it’s negative or distress. The horizontal, time, axis characterizes stress that will be experienced, anticipation, or has been experienced, experience. Note that there is effectively no “now” on this landscape or rather “now” is neutral on both axes. If you pay attention, there really is no such thing as “in the moment”, there can only be very near the moment1. Even more confusing, this entire landscape describes a variety things we experience, which, according to this sketch is backward looking stress. You end of up with challenging tautologies like how do you experience experience? I propose to sort this out by distinguishing between experience and meta-experience. Meta-experience is how we interact with various points on the stress landscape. Experience is how we interact with reality. The two axes create four quadrants of meta-experience, which I’ve labeled in this sketch. The quadrants and our language, of course, have many more nuances than are captured in the sketch. I’m out of time right now, but perhaps I’ll be able to come back and explore these quadrants in future posts. 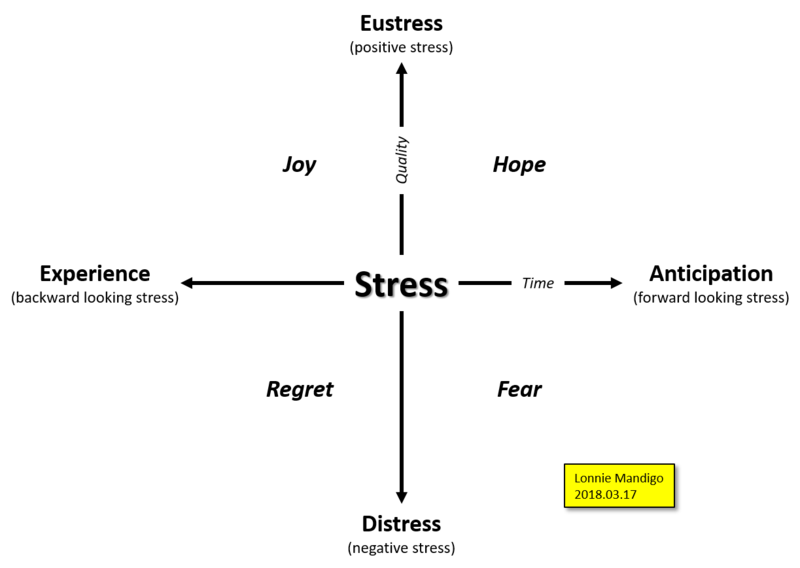 Tagged Anticipation, Distress, Eustress, Experience, Landscape, Meta-experience, Stress, Stress Equation.